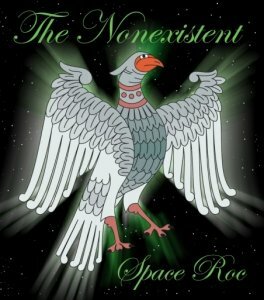 The Nonexistent - "Space Roc"
The Nonexistent are the trio of Chris Gill (Band of Rain) on guitar and synths, Steve Palmer (Mooch, Blue Lily Commission) on bass and synths, and Andy Hole on drums. Chris had been contributing guitar and vocals to several of Steve's Mooch albums and discussions between the two led to the formation of this all instrumental, all improvisational space rock project. The music on these two CDs was produced from three sessions, with the trio jamming and Chris and Steve later adding synths. Disc 1 features the more rock oriented sessions and includes 9 tracks. Among the highlights is Space Roc, with its cool slowly jamming 70s styled guitar/bass/drums heavy rock and a psychedelic edge. Chris is a tasteful guitar soloist, cranking out slow and dirty licks that carry the jam nicely for over 10 minutes. You can hear some electronics in the background but this is mostly about heavy trio jamming. The Keys Are In The Car is similar but Chris' guitar takes on a significantly more acidic quality and he really takes off. Very nice stuff. quietLOUDquiet is a smokin' hot rocker accompanied by rapid fire flittering synths. Slingshot Effect is a totally stoned jam. Criggion Times starts off on the more soothing atmospheric side but quickly gets into down 'n dirty jamming space rock and Chris really rips it up on guitar! This might be the hottest track of the set. I like the dreamy synth waves that accompany the jam on Close To The End. And the organ on Trancendental Medication gives the music a soulful proggy edge. Disc 2 features the more purely spaced out side of the band and includes 8 tracks. The electronics come front and center on In An Immense Universe, supported by guitar and bass. The bass provides the rhythmic pulse for the moody soundscapes and haunting synth lines, and Chris embellishes the proceedings with light jazzy guitar. Metallic is an interesting piece, being a guitar/bass/drums jam which rocks but is very atmospheric and surrounded by a windswept electronic swirl. Penumbra is a short piece with jazzy bass (fretless? ), angelic orchestral synths and other meditative electronic elements. Feedfront is all about howling acidic spaced out feedback guitar and efx, creating a harsh soundscape atmosphere. Other highlights include The Tightrope, which starts off as an easy paced melodic space-prog jam. The pace remains the same but the guitar gets increasingly more acidic and rocking as the jam progresses. And Cosmic Particles is an aptly titled dreamy drifty electronic driven excursion.